PRINCETON, N.J. -- Hillary Clinton's net favorable rating among Democrats and Democratic-leaning independents in November averaged 21 percentage points higher than Sanders', up from a 13-point advantage in September and early October. Both candidates have seen a slight uptick in their favorable ratings among all Democrats since Gallup's last update, which was based on data collected Sept. 12-Oct. 10, just before the first Democratic debate on Oct. 13. But while Clinton's unfavorable percentage has edged downward, Sanders' has increased slightly. The result? The gap between Clinton's and Sanders' net favorable ratings has expanded. Sanders has gained five points in familiarity; even so, only two-thirds of Democrats know enough about the Vermont senator to have an opinion of him, compared with Clinton's nearly universal familiarity. 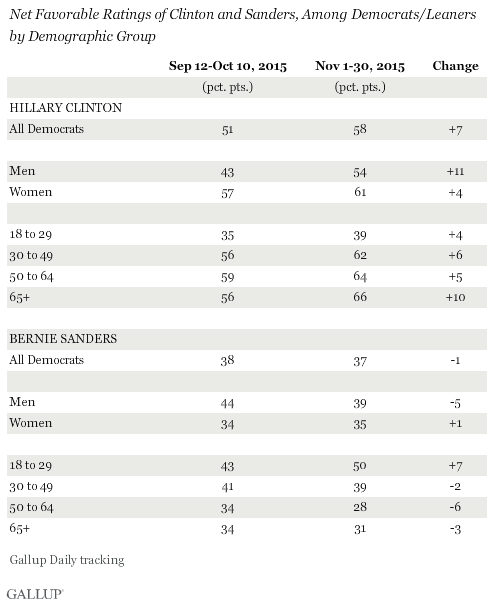 Clinton has a significant image advantage among men and women, as well as those 30 and older. But young Democrats still constitute a problem spot for Clinton, whose image among 18- to 29-year-olds is significantly less positive than Sanders'. Clinton's net favorable image among Democratic men has undergone a significant change, going from a net favorable rating of +43 to +54. Sanders' image among men dropped from +44 to +39 over the same period, with the net result that Clinton has moved from a -1 net favorable deficit versus Sanders among men to a +15 advantage in the latest update. Clinton has not seen this type of gain among 18- to 29-year-old Democrats, however. Her +39 rating among this group in November is up only four points from late September and early October. Meanwhile, Sanders' net favorable rating among young Democrats increased by seven points. That leaves Clinton with an 11-point deficit vis à vis Sanders among those 18 to 29, three points larger than the previous reading. Clinton has extended her already large image advantage among all three groups aged 30 and older, and has a particularly strong positive image among Democrats 50 and older. 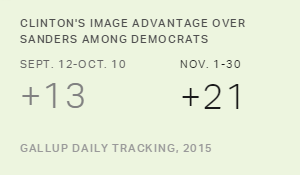 Clinton is both well-known and well-liked among Democrats nationally, and her image improved in November compared with a month earlier. The image of Sanders, her principal opponent, was stagnant over the same period. His favorable rating is now 25 points lower than Clinton's, while his unfavorable percentage is roughly the same. Sanders is hindered in that a third of Democrats do not know enough about him to have an opinion, compared with only 6% of Democrats who don't have an opinion of Clinton. Sanders is 74, six years older than Clinton. But likely at least in part because of his more liberal views, he retains a pocket of strength with 18- to 29-year-old Democrats, among whom he continues to enjoy an image that is more favorable than hers. Sanders was viewed as favorably among men as was Clinton a few months ago, but Clinton is now better liked among both gender groups. The next Democratic debate is Saturday, Dec. 19, and it is possible that the images of both of these candidates among Democrats could change as a result. At this point in the campaign, however, Clinton continues to have the clear image advantage. Results for this Gallup poll are based on telephone interviews conducted Nov. 1-30, 2015, on the Gallup U.S. Daily survey, with a random sample of 1,628 U.S. adults identifying as Democrats or independents who lean Democratic, aged 18 and older, living in all 50 U.S. states and the District of Columbia who rated Hillary Clinton, and 1,592 who rated Bernie Sanders. For results based on these samples, the margin of sampling error is ±4 percentage points at the 95% confidence level. Americans are divided on whether any of the presidential candidates have come up with good ideas for handling the nation's top problems. 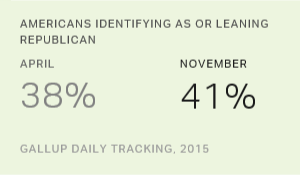 Republicans are more positive about the candidates' ideas than either independents or Democrats.